1987-88 O-Pee-Chee Hockey is highlighted by a tremendous lineup of rookie cards. Several Hall of Famers, fan favorites and postseason heroes all make their mainstream hobby debut with a design that's distinct and hockey-focused. Card fronts have a white border and a think black frame. Other than the photo, all of the action takes place at the bottom of the card. A stick-like icon juts across the bottom-left of the card and holds the player's name. The small gap that's left in the corner has the position. The other side has a black puck and a bold team name. The end result makes 1987-88 O-Pee-Chee Hockey stand out from an already strong list of designs featured in the era. Card backs are mainly pinkish purple. Vital info and the player's name at the top of the card. Career stats and, where there's room, a short bio are on the bottom two-thirds. A simple hockey stick icon divides the two sections. What makes the set even more prominent is the loaded checklist. Top-tier rookies include Luc Robitaille, Adam Oates and Ron Hextall. Other fan favorites making their debut in the set are Vincent Damphousse, Mike Vernon, Stephane Richer, Claude Lemieux, Rick Tocchet and Bill Ranford. The 264-card set also has the second-year Patrick Roy and third-year Mario Lemieux. 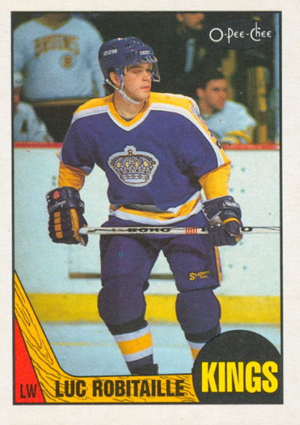 Yet, as great as the checklist is, 1987-88 O-Pee-Chee Hockey is somewhat overlooked. After three consecutive years that brought Steve Yzerman, Lemieux and Roy to the hobby, this set doesn't have quite the same punch, even with such an impressive list of greats.